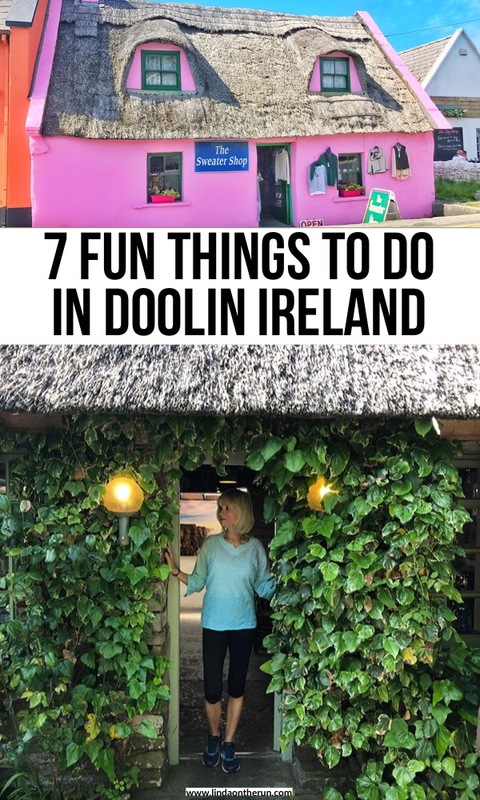 Are you looking for the best things to do in Doolin Ireland? If so, you have come to the to the right place! Doolin is situated in County Clare, in the western mid-section of Ireland on the Atlantic Ocean, along the Wild Atlantic Way, so it boasts super epic vistas. Located three hours from Dublin, and approximately ninety minutes from Galway, Doolin is definitely a charming Irish seacoast town not to be missed. The closest town to the Cliffs of Moher makes Doolin a great place to stop and rest and explore the area. Doolin boasts the most spectacular seascapes that will leave you breathless. The bucolic farmlands of Doolin with its grazing sheep and cows will also make an impression you will not soon forget. Even though all the things to do in Doolin attract busloads and carloads of tourists, like us, Doolin still retains her local charm, as it is not as large as Killarney or Dublin. Some of the things to do in Doolin are in the town and some are located on her outskirts. 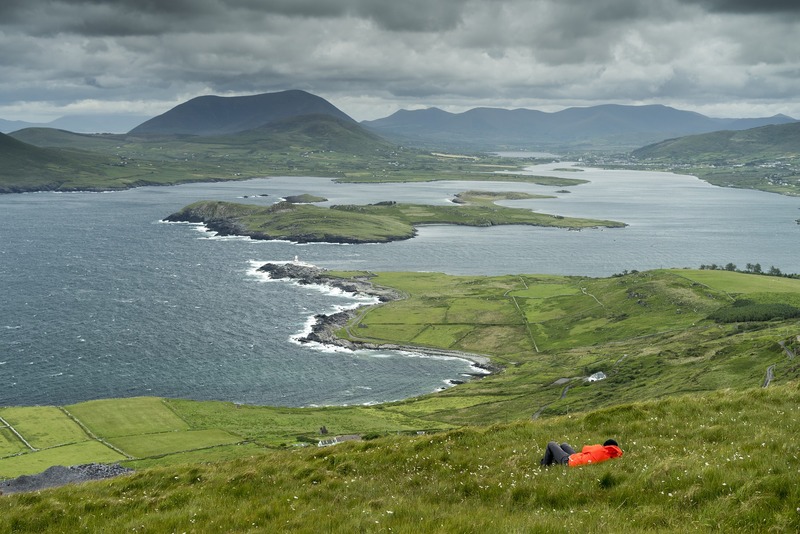 Whichever of the suggested things to do in Dingle you choose, you will be richly rewarded. 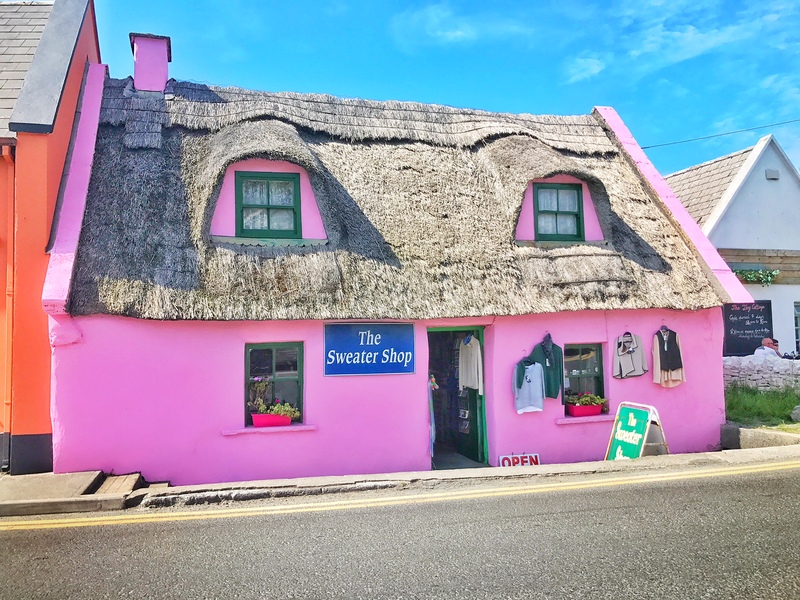 Charming Instagram worthy pink shop in Doolin Ireland. 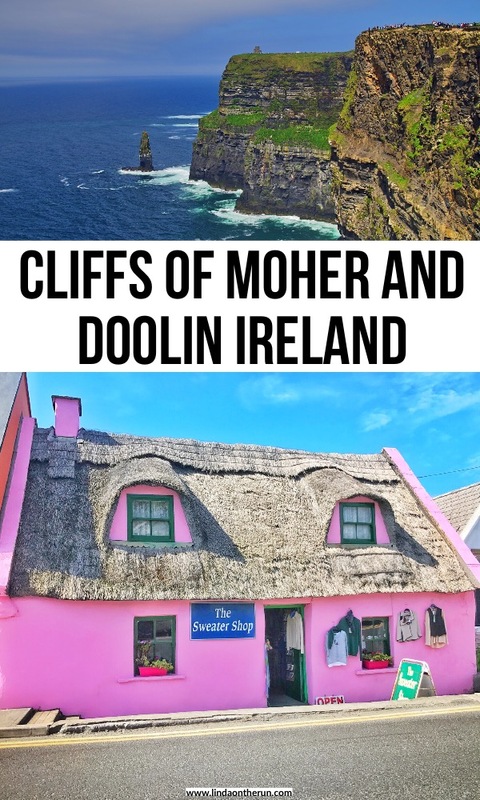 Let us face it: most of us travel to Doolin because seeing the epic Cliffs of Moher is tops on our list of things to do in Doolin. And rightly so! The Cliffs of Moher are magnificent and worthy of our attention. The Cliffs of Moher boast of being one of the most popular tourist attractions in all of Ireland. 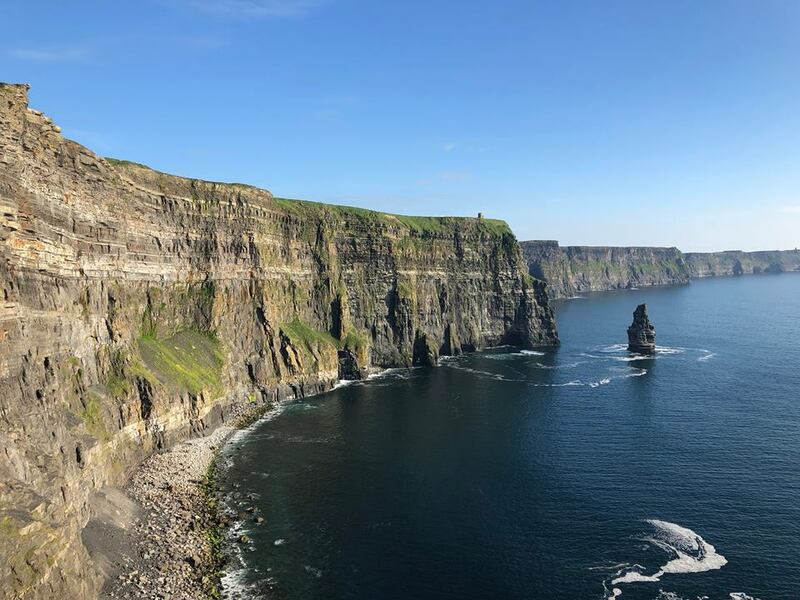 Rising a spectacular seven hundred feet reaching for the sky, and hugging the Atlantic Ocean for an impressive five miles, the Cliffs of Moher are Mother Nature’s handiwork and definitely not to be missed. On a clear day like we had, the Cliffs of Moher and the Atlantic Ocean can be seen for miles! 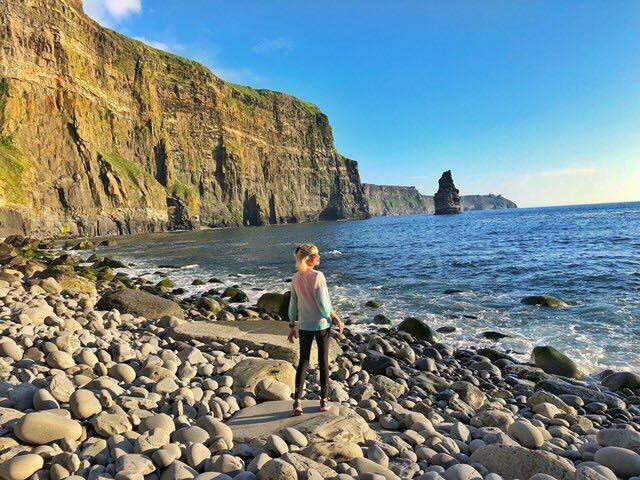 If you are adventurous, starting in Doolin, you can walk the Doolin Coastal Trail to the majestic Cliffs of Moher as one of your top things to do in Doolin. This spectacular walking trail is only 8k long (a bit under 5 miles) and well worth any effort it would take. You will be richly rewarded with stunning views of the Atlantic Ocean and even the Aran Islands on a bright and sunny day, and of course, the Cliffs of Moher as you draw near to them! You will want to bring along your own nondisposable water bottle with you when visiting the Cliffs of Moher. This leakproof and foldable 26 oz outdoor water bottle would be a great choice. It is FDA approved and BPA free. Also, if you travel by plane to Ireland, this foldable water bottle would not take much space in your luggage. If plastic is not your thing, this stainless steel double walled leakproof choice may interest you. It comes with two lids, a variety of sizes to select from and comes in several colors. The closer you approach the Cliffs of Moher, the more crowded with tourists the trail becomes. You can choose a self-guided tour, or hire a local guide who is well-versed in the local history. The guided tour lasts about three hours. 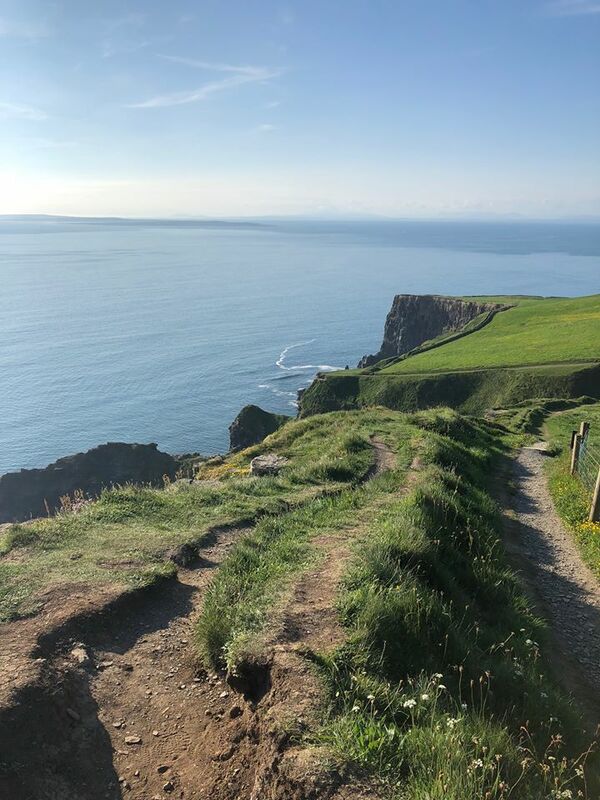 If you decide to go it alone, I would still suggest you leave at least two hours to enjoy all the views you will encounter: the bucolic countryside full of sheep and goats, and the Atlantic Ocean in all her splendor on your way to the Cliffs of Moher. One of the most amazing things to do in Doolin is walk the Doolin Coastal Trail. Here is a very small part of it. 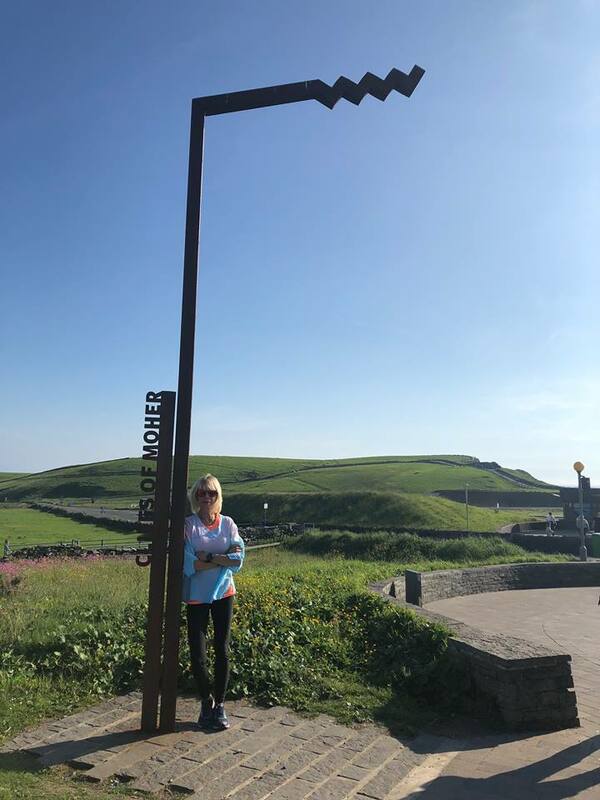 A pair of sturdy closed-toe shoes, or sneakers, are something to consider when making your list of things to do in Doolin Ireland. They will offer support and stability for walking and hiking. These Merrell Edge Hikers are a great choice. They are reasonably priced and come in several colors to choose from. A bit less expensive, these Skechers D’lites memory foam lace-up sneakers come in lots of colors to choose from. And these Skechers flex appeal sneakers are very affordable and come in lots of colors to choose from that would match any wardrobe you might be bringing along to Doolin Ireland. Another of the interesting things to do in Doolin to put on your list to consider is viewing the Cliffs of Moher from the sea level. That would be quite another perspective altogether! You can take a boat tour leaving from Doolin Pier that lasts approximately one hour. Viewing the Cliffs of Moher from sea level. If you decide to add taking a boat tour to your list of things to do in Doolin Ireland, you will want to have an overcoat, because it is always cooler on the water, no matter what time of year you travel to Doolin. You might consider bringing along this Columbia Benton Springs full zip fleece jacket with you. It is available in many colors. This hooded lightweight waterproof jacket is very affordable and is a good choice for chilly weather. Sometimes just a hooded lightweight windbreaker is sufficient for chilly weather. It is cheap and offered in a variety of colors. Of course, one of the most popular ways to get to the Cliffs of Moher is driving your own vehicle. Please do be advised that you will have to pay for parking. And while the parking lots are expansive, they are located quite near the entrance of the Cliffs of Moher for your convenience. Snapping a picture at the entrance to the Cliffs of Moher is one of the great things to do in Doolin. You will want to protect your eyes from the sun’s harmful rays while in Ireland and a pair of sunglasses (as I am wearing in the picture above) is a good thing to bring along. These unisex polarized glasses with UV protection are stylish. I really like these unisex polarized sunglasses because they are unbreakable! Make sure you take some time to visit the Cliffs of Moher Interpretive Center. You will see this huge domed underground building built into the side of a hill, which you notice on your right, once you enter. The visitor center contains lots of useful information and history concerning the Cliffs of Moher. There are restrooms located right at the interpretive center, so make sure to make use of them before you begin your exploration of the Cliffs of Moher! 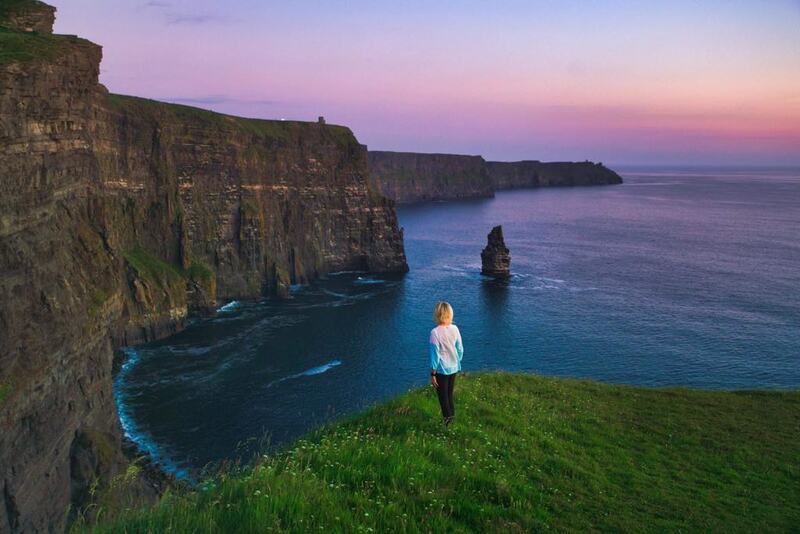 Viewing the sunset at the Cliffs of Moher is definitely one of the unforgettable things to do in Doolin! With all the adventurous things to do in Doolin and the surrounding area, you will work up a hearty appetite for sure. Doolin boasts a cornucopia of restaurants and gastropubs for you to choose from. When visiting Doolin, we chose to have dinner at the Ivy Cottage. The weather was perfect and we decided to eat out on their patio. My vegan meal was scrumptious and I highly recommend this restaurant. There were no other complaints either from the vegetarian and omnivore traveling with me. The restaurants and pubs of Doolin make every attempt to cater to every need of their guests. Dinner at the Ivy Cottage is one of the best things to do in Doolin. A trip to the Aran Islands is one of the epic things to do in Doolin Ireland! Consistently one of the most popular Irish tourist attractions, a day-trip to the Aran Islands from Doolin remains one of the most exciting things to do in Doolin. 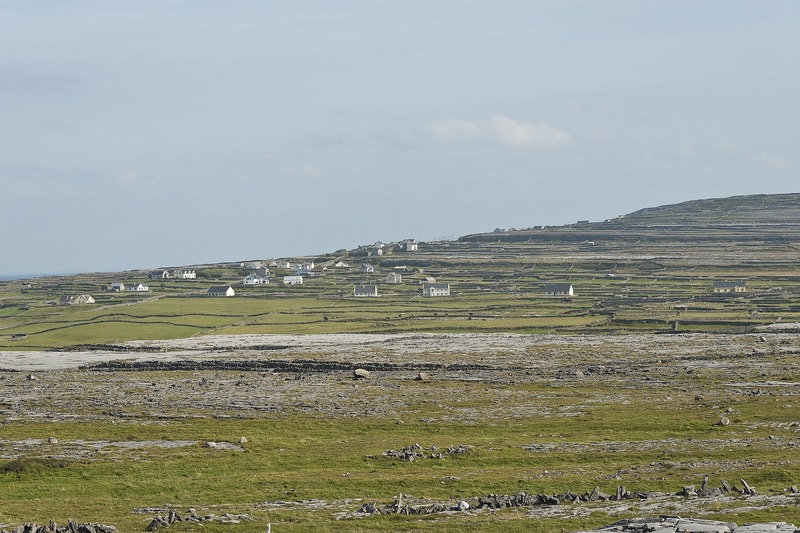 The three Aran Islands are world-renown for their geology, history, and Irish culture, and one of the rare places where the inhabitants continue to use their native Irish language every day! Sunset over the Aran Islands looking from the Doolin Coastal Trail. You can get to the Aran Islands from Doolin Pier using several local ferry companies located there which operate generally from March until November. These ferry companies use the most direct route to get to the Aran Islands from Doolin. Due to seasonal weather conditions, the ferry schedule may change, so make sure to check with your ferry company and be aware of your scheduled sailing. If you decide on a day-long trip to the Aran Islands, you will want to bring along a backpack/daypack to carry all your necessities like an extra sweater, water bottle, and snacks. This unisex lightweight foldable/packable water-resistant daypack folds into its own pouch, making it easy for packing when not in use. And the color options are amazing! If you are looking for something a little more serious, but that does not cost much more, this unisex travel backpack is water-resistant and TSA-friendly and comes with many other features. Once you have arrived at the Aran Islands, you have many options! It is literally like taking a step back in time. You can take a guided tour, or hire bicycles and head out to explore the raw beauty and local culture the Aran Islands offer. Romantic winding roads and the beaches all inspire wonderful memories which you will carry back home with you! And there are plenty of spirited Irish restaurants and cafes for you to discover. Make sure you do not leave the Aran Islands hungry. A charming Aran Islands village. Read next: Charming things to do in Killarney for first-time visitors. One of the most enjoyable things to do in Doolin is to listen to Irish music! Doolin has the reputation of being the home of Irish music, and the most musical village in all of County Clare! It is often said there are more musicians per square mile in Doolin than anywhere else in the entire world! The Doolin pubs and musicians are world renown for traditional Irish music. Most of the local pubs or music houses start their loud and often raucous music “sessions” around 9:30 PM, but to be sure, check with the local establishments to verify. In Doolin, there are several pubs for you to choose from, to investigate just exactly what is so iconic about the local Doolin music scene and the popular Irish music sessions. The Burren appears not to be part of our earth, but of another planet, and certainly deserves to be on your list of things to do in Doolin. The word “Burren” actually translates to mean a “rocky place,” since the limestone rock landscape you will encounter looks nothing like the enchanting rolling green hills of Ireland that you are accustomed to seeing on your Irish trip thus far. The otherworldly lunar and dramatic landscape is very much worth adding to your list of things to do in Doolin. 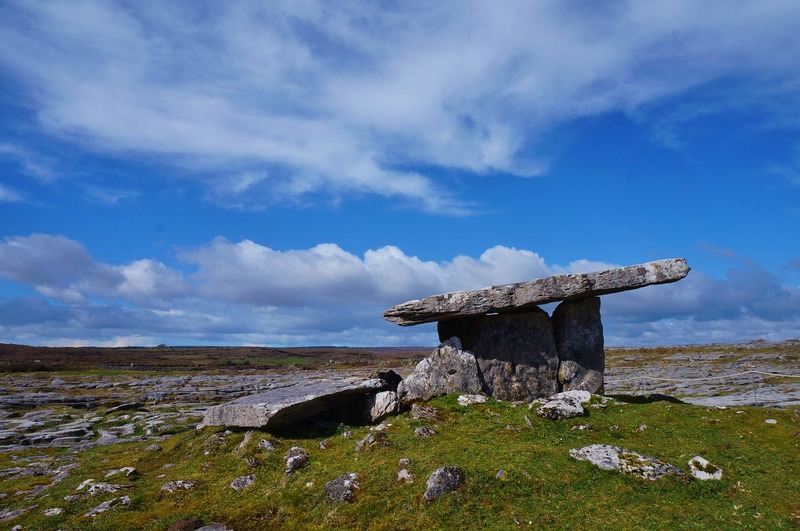 The Burren region is comprised of about 116 square miles starting in Doolin and boasts many interesting geological patterns, tombs, and historical ruins. There are also many trails and walks for you to choose from to see up close and personal the stone grey landscape and the archeological forts, stone crosses and tombs. You even have the option of taking a guided tour with a local guide. 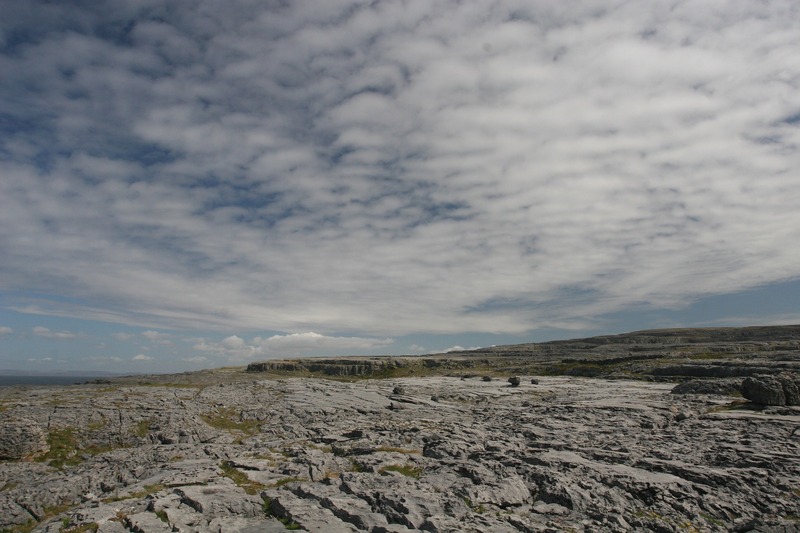 there are a lot of options for exploring the Burren to add to your things to do in Doolin list. Ancient rock formations found in The Burren near Doolin, County Clare. Located in The Burren Region just outside of Doolin Ireland is Doolin Cave. Stop at the award-winning Doolin Cave Visitor Center to begin your visit. There is an admission fee and to save time and money, plan to purchase your tickets online beforehand. The star and main attraction of Doolin Cave is the magical Great Stalactite. It is an astounding 23 feet (7.c meters) long hanging down from the cave ceiling. 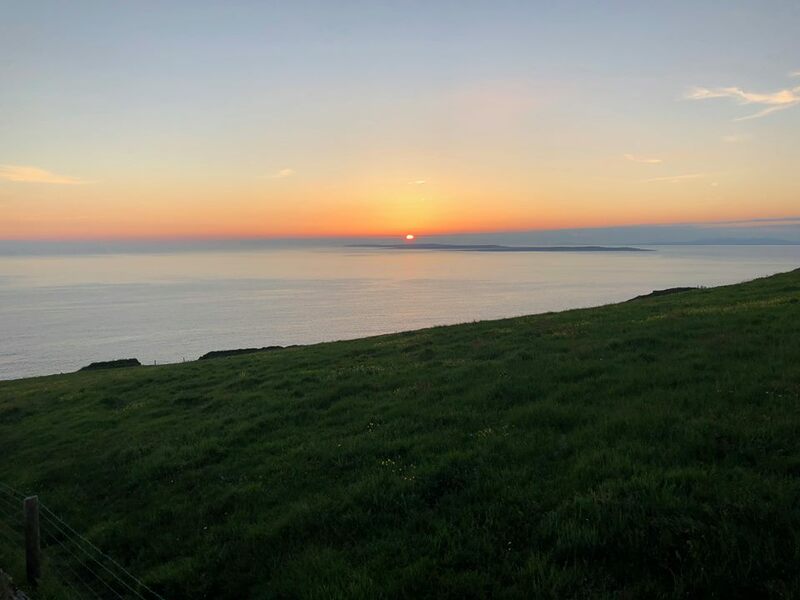 It is so unbelievable it has to be seen to be believed and should be added to your list of things to do in Doolin Ireland. 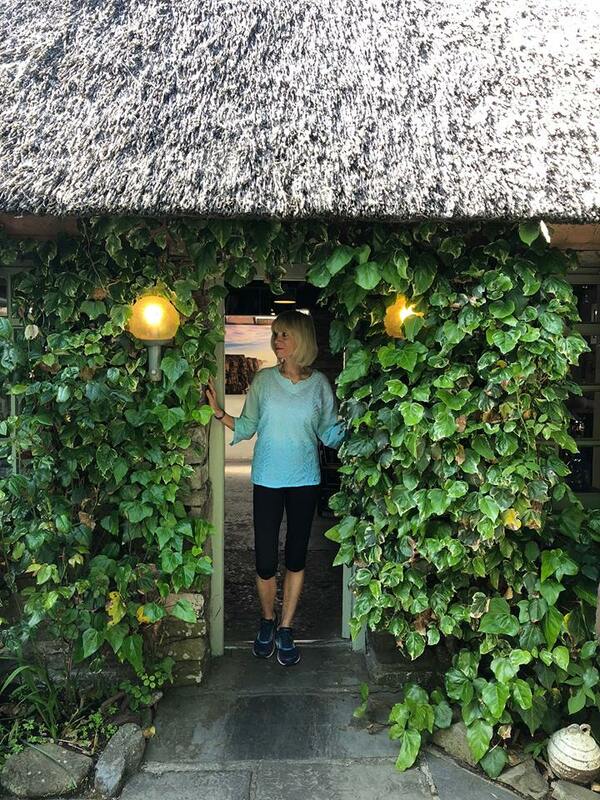 You can extend your trip at Doolin Cave by hiking the farmland Nature Trail, having a bite to eat at the cafe, and shopping for hand-crafted items in the gift shop. Located approximately one kilometer from Doolin, and situated on a hill halfway between Doolin Village and the Cliffs of Moher you will discover Doonagore Castle. It is an iconic County Clare landmark and should be added to your list of things to do in Doolin Ireland. It is a round 16th-century tower house with a small round courtyard enclosure. Because of its location, up on a hill overlooking Doolin and the Atlantic Ocean, the pristine vistas are spectacular. There are opportunities galore for wonderful and memorable photographs. Doolin Ireland is located on The Atlantic Ocean, along the Wild Atlantic Way. Views are jaw-dropping spectacular! Renting a car is one of the best ways to travel the Wild Atlantic Way and see all the breathtaking vistas and views all along the way. You would have your own transportation to the various attractions in and around Doolin and could plan your days on your own schedule. Whether you drive or ride on a tour bus, beautiful views along the Wild Atlantic Way will inspire you. 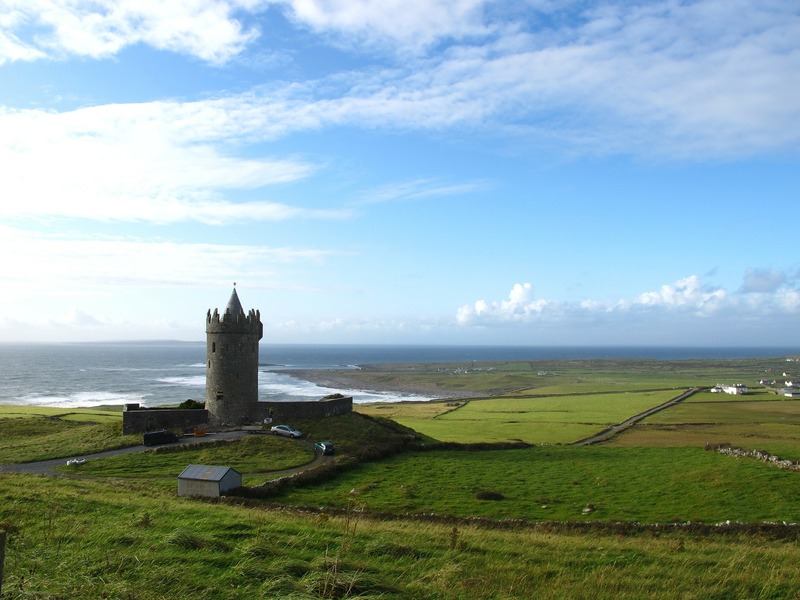 If a car rental is not in your plan, there are lots of guided tours headed to Doolin. The pro about being on a guided tour is you are chauffeured around in a huge comfortable bus or van and driven to the different and various locations. Each way has its own pros and cons, and it is for you to decide the best way to travel to Doolin Ireland that is most convenient and practical for you and your traveling companions. How Long Should You Spend In Doolin? What you have on your list of things to do in Doolin Ireland will dictate how long you will spend there. If you are on a tour, then the amount of time you have to spend there will be figured into the tour’s itinerary. If you are traveling independent of a guided tour group (on your own!) I would suggest anywhere from an afternoon to several days. You can make a quick stop for lunch at one of the quaint Doolin restaurants, on your way to the Cliffs of Moher or the Burren or Doolin Cave. 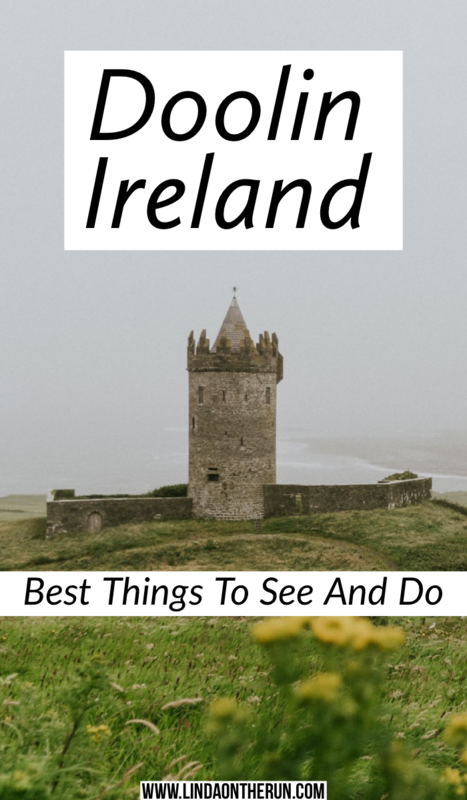 Or if you have a leisurely amount of time, you can choose to stay for several days and visit all the attractions, and even perhaps the Aran Islands on an itinerary that suits your schedule. Doolin Ireland, located on the Wild Atlantic Way is way more than just the city located “close to the Cliffs of Moher.” There are so many other things to do in Doolin and her surrounding areas, that this quaint little town is a must-visit location on your next trip to Ireland! 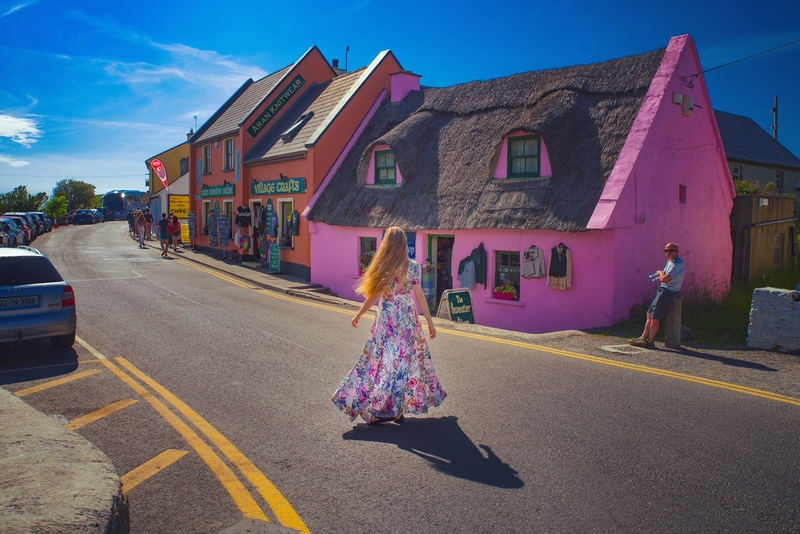 On your visit to Doolin Ireland, you can snap a memorable Instagram shot just as Victoria and Terrence of Follow Me Away did. Have you ever been to Doolin during your visit to Ireland? Did you find it as exciting as I did? Please post your experiences in Doolin in the comment section below. Oh, Karen I certainly agree, Ireland does have a lot to offer! That pink, what a color!!! This sounds like Doolin has it all! I’ve always wanted to spend some time on the Aran Islands and near the Cliffs of Moher – good to hear there is even vegan food. I found that a bit challenging in Killarney which is the only place in Ireland I’ve visited so far… I need to change that!! Doolin & The Cliffs we’re both epic. In Killarney we found a pizza shop that amazingly had vegan cheese. What an awesome surprise for me! Cliffs of Moher are on our list for a while now. Hope to get there some day! I hope you get to the Cliffs someday Alina! They are so worth it. Great pictures!! I was just thee in May and can’t wait to go back!! Excellent blog post Linda! Thank you for sharing your experience of Doolin with the world, it’s always nice to hear such great feedback from our visitors.